BEIRUT (AP) — Syrian President Bashar Assad vowed Sunday to continue with a military offensive in a rebel-held region near the capital, as troops and allied militias captured a number of villages and towns in the largest advance since a wide-scale operation began last month. Speaking to a small group of reporters in Damascus, Assad said the five-hour daily "humanitarian pause" in eastern Ghouta would continue, to allow for any civilians wishing to leave the area to do so. "There is no contradiction between the truce and the military operation," he added. Assad also denied that the Syrian government carried out toxic gas attacks, describing such reports as part of the western countries' "dictionary of lies." Meanwhile, the United Nations said it planned to deliver aid to a total of 70,000 people in the stricken region starting Monday after it received approval from the government to move in. U.N. officials had said lack of approvals and consensus among the warring parties, as well as the limited duration of the five-hour Russian-ordered humanitarian pause, had made aid delivery impossible. Syria's Central Military Media said government forces captured at least six villages and towns along the edge of eastern Ghouta in the advance that began late Saturday. The Central Military Media later said the troops continued their movement, reaching the outskirts of Mesraba, in central Ghouta. The military advances come amid reports of wide-scale internal displacement as civilians flee government forces. A reporter from state-run Al-Ikhbariyah TV accompanied the troops and broadcast from Nashabiyah, a village on the southeastern edge of eastern Ghouta. The reporter said the Syrian troops had crossed a "moat" and seized around 12 square kilometers (4.6 square miles). The advance was backed by intense shelling and airstrikes. Rebel factions said they launched a counteroffensive Sunday, sending fighters behind government lines in a series of attacks. 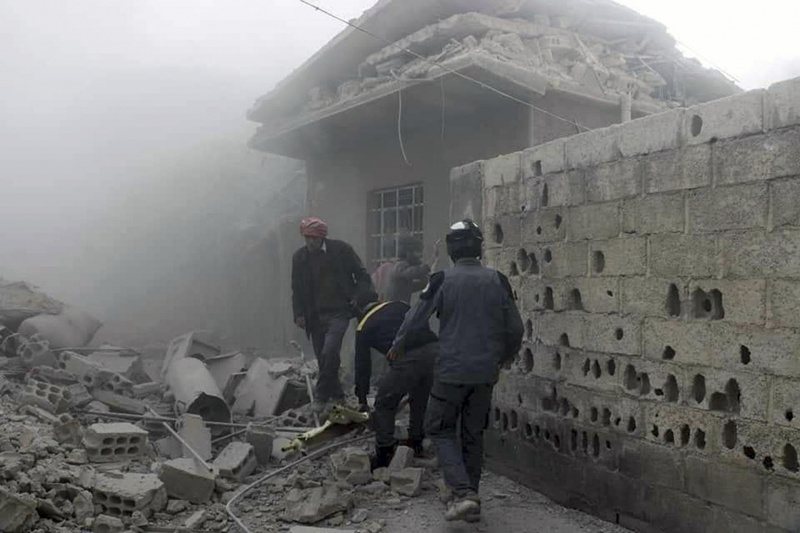 The Syrian Observatory for Human Rights said the rebels regained control of at least one town and fighting continued. The Observatory and the Syrian Civil Defense said civilians had fled their homes because of the advancing troops, with many of them taking cover in underground shelters. "It is a scorched-earth policy," said Ghouta-based activist Nour Adam. "People are moving out because of the relentless bombing." Eastern Ghouta, home to some 400,000 people, has been under a crippling siege and daily bombardment for months. More than 600 civilians have been killed in the last two weeks alone. Hamza Beriqdar, spokesman of the main rebel faction in Ghouta called the Army of Islam, said in an audio recording shared on social media that the opposition fighters had to retreat from some areas in eastern Ghouta amid a hail of fire from artillery shelling, airstrikes and helicopter attacks, also calling it a "scorched earth policy." He said the rebels are regrouping and will continue to fight, and he called on civilians in Ghouta not to lose faith or criticize rebel fighters to keep a unified front and maintain morale. Meanwhile, no civilians have left Ghouta through a humanitarian corridor set up by Russia and the Syrian government nearly a week ago. Russia has accused the rebels of preventing civilians from leaving, which insurgents have denied. The rebels say the humanitarian corridor is part of government efforts to forcibly displace the population, and have called on government forces to implement a full cease-fire adopted by the U.N. Security Council. Al-Ikhbariya TV quoted an unnamed military official as saying the latest operation came in response to the shelling of Damascus and the surrounding area by rebels. The official said preparations are underway to deliver food to civilians in the besieged area. The White House condemned the offensive in eastern Ghouta, saying in a statement Sunday that the Syrian campaign backed by Russia and Iran is killing "innocent civilians under the false auspices of counterterrorism operations." "This is the same combination of lies and indiscriminate force that Russia and the Syrian regime used to isolate and destroy Aleppo in 2016, where thousands of civilians were killed," the U.S. statement said. Also on Sunday, the office of French President Emmanuel Macron said the French leader "strongly urged" Iranian President Hassan Rouhani to pressure the Syrian government to end "the indiscriminate attacks against the besieged populations of eastern Ghouta, to allow humanitarian access and evacuate the critical medical cases." In a phone call, Macron and Rouhani agreed to work together in the coming days to obtain results on the ground, deliver the necessary assistance to civilians and implement the U.N.-sponsored cease-fire, the French president's office said in a statement. Macron made a plea to Rouhani about the situation in eastern Ghouta because of the "links" between Iran and the Syrian government, the French statement said. Eastern Ghouta has been besieged by government forces since 2013. The last aid delivery to Ghouta was on Feb. 14, when help was sent to around 7,000 people in Nashabiyah, now under government control. In a statement Sunday, the U.N. said it plans to deliver aid to Douma, the largest town in eastern Ghouta, with its partners on the ground. An aid convoy consisting of 46 truckloads will be allowed in Monday with health and nutrition supplies and food for 27,500. The convoy will be led by Ali al-Za'tari, the U.N. resident humanitarian coordinator in Syria. "We hope that the convoy may proceed as planned and will be followed by other convoys," al-Za'tari said. The U.N. said it has received assurances that the next convoy will be delivered on March 8.